Home→Biodiversity Offsets on the ground→Policies and Governance of Biodiversity Offsets→How can regulators support business to go green? Please share your knowledge and experiences! A request on sup­port­ing busi­nesses to improve the out­comes of their oper­a­tions for bio­di­ver­sity was pro­posed by the Scot­tish Envi­ron­ment Pro­tec­tion Agency (SEPA). In response to this EKLIPSE is launch­ing an open Call for Knowl­edge invit­ing sci­en­tists, pol­icy mak­ers, prac­ti­tion­ers and other soci­etal actors to share their knowl­edge and avail­able resources on this spe­cific selected request. 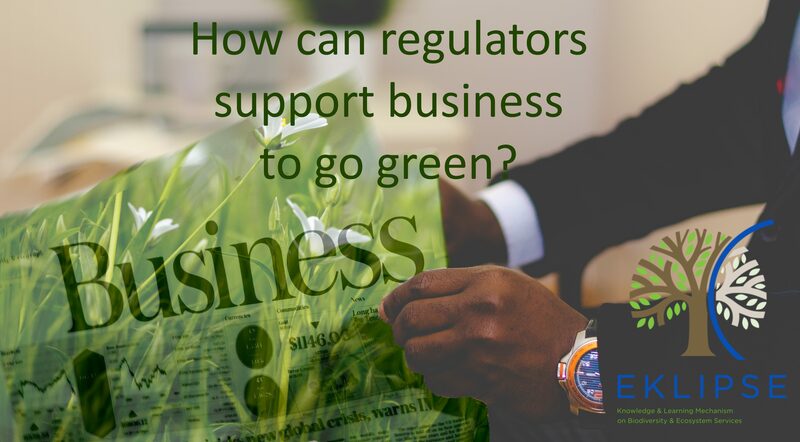 Gov­ern­ment organ­i­sa­tions and reg­u­la­tors have a key role in help­ing small and medium-sized enter­prises (SMEs) oper­ate com­pet­i­tively yet in a more envi­ron­men­tally sus­tain­able way. SEPA is work­ing to imple­ment their new reg­u­la­tory strat­egy ‘One Planet Pros­per­ity’, which sum­marises the agency’s vision for ways they can work with Scot­tish busi­nesses to enhance envi­ron­men­tal sus­tain­abil­ity. SEPA would like to find out which approaches and tools they and other reg­u­la­tory agen­cies in Europe could adopt when work­ing with SMEs to achieve this vision, from com­pli­ance with manda­tory envi­ron­men­tal stan­dards, to going beyond com­pli­ance, and encour­ag­ing and pro­mot­ing vol­un­tary par­tic­i­pa­tion. The aim is to under­stand and eval­u­ate how effec­tive these var­i­ous approaches, tech­niques and incen­tives are in chang­ing employee behav­iour and com­pany cul­ture as well as cus­tomer behav­iour and mind-set, and ulti­mately improv­ing bio­di­ver­sity out­comes of busi­ness operations. The objec­tive is to iden­tify the range of approaches, from envi­ron­men­tal com­pli­ance to vol­un­tary agree­ments, avail­able to enhance sus­tain­abil­ity and bio­di­ver­sity con­ser­va­tion; iden­tify lessons learned from case stud­ies where par­tic­u­lar approaches have been applied with cer­tain types of SMEs, and an analy­sis of what has worked or not, why and how? All knowl­edge col­lected through this call for knowl­edge will be col­lected and dis­cussed on the KNOCK Forum (http://www.eklipse-mechanism.eu/forum_home). To upload doc­u­ments and par­tic­i­pate in the dis­cus­sion, please reg­is­ter at our quick and easy ‘Keep me Posted’ page (http://www.eklipse-mechanism.eu/keep_me_posted). Then, please click on the rel­e­vant thread to upload your information. — and poten­tially many others. The full Call for Knowl­edge (Call for knowledge_improving bio­di­ver­sity out­comes of busi­ness operations_16March2017) and more infor­ma­tion on the processes and the EKLIPSE project is avail­able at www.eklipse-mechanism.eu.